We have loved having this pool heater available to boost the pool temps a bit in the spring and fall. It has worked great although over the last year and a half has lost some efficiency. Taking the advice of some great feedback on the first build I am going to try a few new ideas with this and see if I can't get a more efficient heat transfer and boost the temps up even more! 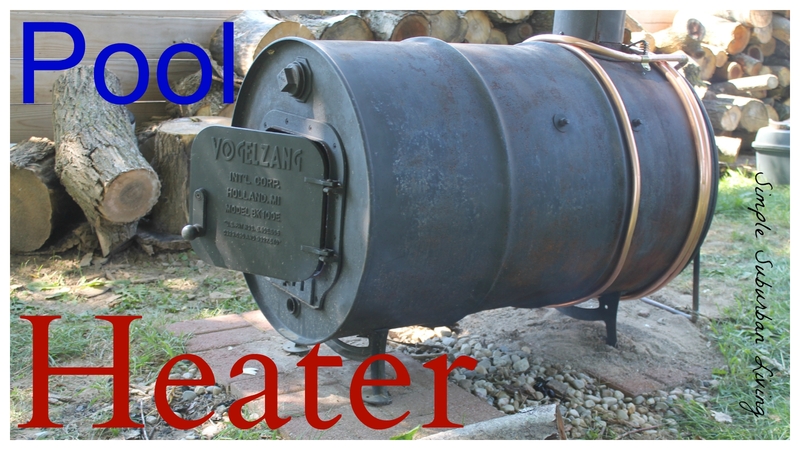 The coil on the inside is much more efficient at absorbing the heat; however, it does not hold up as well over time since it collects soot and creosote over time and becomes less efficient. Overall this is the best approach but you will need to take the coil out each year and clean it up. The second approach was to wrap the coil around the outside of the barrel. This also works very well but in order for it to be most efficient it will need to be covered in some sort of insulation to keep the heat around the tubing. I noticed that the outside area of the tubing is actually working like a heat sink and cooling the outer side. With good insulation wrapped around the barrel with the tubing in between the heat would be trapped and provide the best heat exchange to the water. I am currently looking for some good outdoor insulation that I can use for this application. In the meantime I have both the coil on the outside and the one on the inside in use and the temps I am getting are fairly close to what I had when I first started the project last year. This has been such a fun project to work on and experiment with and I am excited for the winter season so I can test it's use heating my garage again! Stay tuned for updates on that and thanks for stopping by!